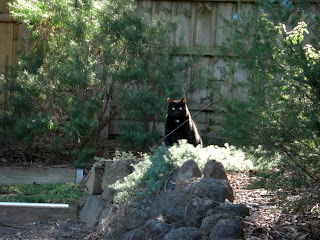 A couple of photos to liven up this otherwise boring blog...I haven't much to write about here lately! Isn't this a cute mat? I found it at Aldi's last week, and decided immediately it had to go in our kitchen. I stand on a mat at the kitchen sink, because when I spend so much time in one spot, the tile floor makes my feet and back ache after a while. A soft mat makes quite a lot of difference. 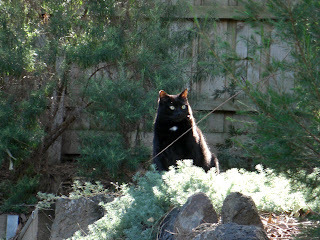 Topsy was sitting in the sun up in the back yard today and looked so cute when I looked out the back door and saw her. She sat there and gazed at me long enough for me to get these pictures. I love the halo effect of the sun on her glossy black coat. topsy looks so mysterious...like a magical cat about to cast a spell on something! Don't you just love the Aldi stores. We had one open up about 1/2 mile from my house in Chicago and I just love it. Unfortunately I would have to drive about an hour to get to one in Florida so do not. With the price of gas anything I would save would be eaten up but I can't wait to get back to my one at home. 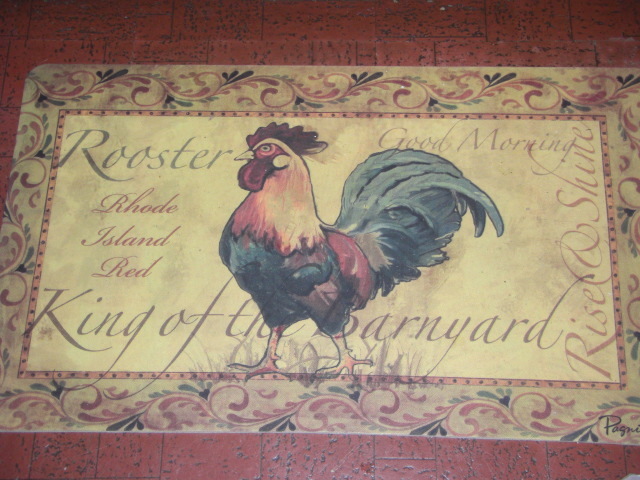 Love the rooster rug. I to use a small one under my feet at the sink. Especially on the hard tile floors. Oh dear, you make me feel that I should keep that painting. I don't mind keeping linens - they fit in a drawer!